There is something about really being able to see the stars at night. Living in DC doesn't allow for all that much star gazing...it just always a bit to bright from the city lights. But I can remember as a kid laying at the end up my driveway in the summer and just gazing up at them while talking to friends. We would talk about boys, what the next school year would be like and anything else "under the stars". I can also remember gazing up at them on car rides that went into the night...thinking about what was out there and what was ahead in life. There is just something about how endless they seem...even though in reality the light we are seeing is stars that have actually burned out years ago...that makes it seem like anything is truly possible in life. That if you put your mind to something, and really try the possibilities are endless. This past week at work, I had a discussion with a couple of co workers about following what you are passionate about and the best timing for that. I have kind of always just thought that I would eventually just know when the right time was. The "stars" would align and I would then know that it was time take the jump and shoot for them. I am by no means saying that time is now....it's just not yet. But as a sit staring out of the airplane window starring at the stars on the way back to DC it just left me wondering and reminiscing about all of the dreaming I used to do. For now though I am going to focus my dreams more directly on new ideas for delicious baked goods and keep the "long term" dreaming as just that. That is not to say I won't try and make a little lead way in the right direction. 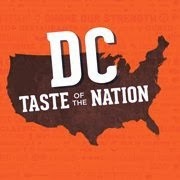 For instance I am trying to broaden my knowledge on food and planning events by helping out with Share Our Strength's Taste of the Nation DC event on Monday, March 31. It has been a whole different ballgame trying to help out on the Silent Auction Committee around the constant travel from work. It has been fun though and I am super excited for this event in a few weeks, mainly because it is such a great event! Let be real though, before when I was talking about the constant travel...I was not meaning to complain when my office was outside last week with a view like the above in about 70+ degree weather. Okay on to the donuts...these were inspired by the meyer lemons themselves. I was at Trader Joe's and they just looked so beautiful that I had to buy them. The questions was...what to bake with them? I decided upon some yummy baked lemon donuts and to have twist add powdered sugar like lemon bars. The combination was big hit at the office...even for folks who would not normally have given them a try. So whether you can find meyer lemons in your grocery store or only have regular ones, either will work and give them a try! Enjoy! Eggs, lemon zest, lemon juice and non-fat Greek yogurt. Whisk in the dry ingredients and then spoon into the pan. I just so happened to now own the perfect tea towel to take pictures with these donuts...Thanks Hopple! 1. Heat your oven to 350 degrees F and generously spray two 6 capacity donut pans with non-stick cooking spray. 3. In a small bowl, whisk together the canola oil, meyer lemon juice, zest, buttermilk, vanilla and eggs. 4. Combine the wet ingredients into the dry and stir just until incorporated. 5. Carefully spoon the batter into the donut pans, filling almost to the top and bake for 13-15 minutes or until a toothpick inserted in the center of one of the donuts comes out clean. 6. Let cool slightly before removing to a rack to cool completely. 7. Once donuts are cooled, fill a shallow bowl with powdered sugar and dip the bottom of each donut in the powdered sugar until generously coated. The bottom will now become the top. Serve that day for best taste. Enjoy!